Charles Trenet (1913-2001), was a French singer and songwriter. He was most famous for his recordings from the late 1930s until the mid-1950s, though his career continued through the 1990s. 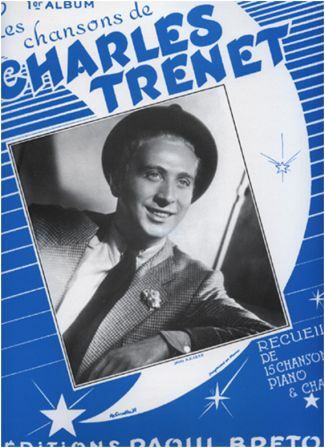 In an era in which it was unusual for a singer to write their own material, Trenet wrote prolifically and declined to record any but his own songs. His best known songs include "Boum! ", "La Mer", "Y'a d'la joie", "Que reste-t-il de nos amours? ", "Ménilmontant" and "Douce France". His catalogue of songs is enormous, numbering close to a thousand. While many of his songs mined relatively conventional topics such as love, Paris, and nostalgia for his younger days, what set Trenet's songs apart were their personal, poetic, sometimes quite eccentric qualities, often infused with a warm wit. Some of his songs had unconventional subject matter, with whimsical imagery bordering on the surreal. "Y'a d'la joie" evokes joy through a series of disconnected images, including that of a subway car shooting out of its tunnel into the air, the Eiffel Tower crossing the street and a baker making excellent bread. The lovers engaged in a minuet in "Polka du Roi" reveal themselves at length to be "no longer human": they are made of wax and trapped in the Musée Grévin. Many of his hits from the 1930s and 1940s effectively combine the melodic and verbal nuances of French song with American swing rhythms. Many of his songs have been used in movies. Further info can be found in his entry in Wikipedia. Click here for the song "Le soleil et la Lune" with words visible. Click here for a computer animation of the song "Le soleil et la lune"
Click here for the song "Boum" with the words in French. Click here for the song "La Mer"
Click here to watch the end of Mr Bean's Holiday featuring Trenet's song "La Mer"
It sings "love in bloom"